Adelaide's first and only anime film festival! 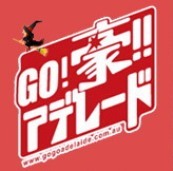 Held annually, AnimeGO! is a showcase for aspiring animators, film makers and artists. The festival encourages creators to produce content with a Japanese influence, whether it be animation films (anime), artwork or music. The festival's highlight will be the screening of the top entries from our film making competition, along with a mixture of five anime films. We will also be announcing the winner of our short anime film making competition with the prize being a TRIP TO JAPAN! Cost: Films just $10 each if pre-purchased online or $12 at the door. Entry to the festival is FREE! Family-friendly, suitable for all ages with plenty of free activities for the kids! Plus, make sure to pop into our Maid Cafe and say hi to our friendly butlers and maids who will be serving treats all day long!